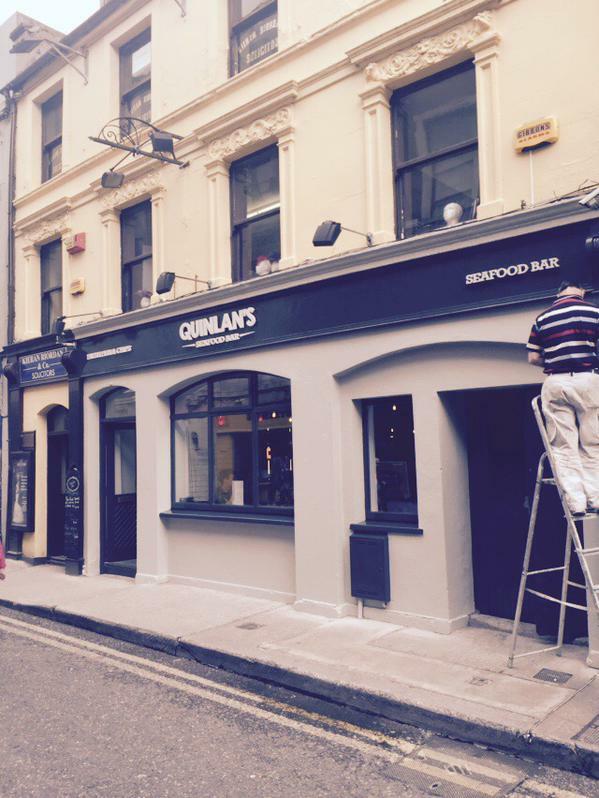 This week it was fantastic to see the doors open of a new fish restaurant, Quinlan’s in Princes Street in Cork – things are definitely improving and people having the confidence to open new places is proof of this. Something even more fantastic was the little sandwich board that I spotted outside Nash 19, one of Quinlan’s neighbours. Instead of listing the specials for the day “Welcome to our new neighbours” it read, which was a very generous gesture from another restaurant, who effectively would be a competitor of sorts of the newcomer. As usual I like to tweet when I see a new business opening and very cleverly Quinlan’s responded to my tweet by inviting me and the Fuzion gang in for our #FuzionFriday lunch, which is our team tradition, one that we have kept going for 15 years. We duly accepted the invitation and enjoyed a really great ‘fish and chips‘ lunch (and some vino!) at Quinlan’s and when we were there we had a great chat with their owner, Liam Quinlan, a Kerryman from Cahirciveen. The first thing he mentioned was the fantastic support and welcome he had received from his new neighbours, many of which would be competitors. He spoke about the Nash 19 sandwich board, he mentioned Ernest Cantillon from Electric, Salvatore and his mum from Rossini’s and some of the traders from the English Market who all popped in to wish him the best. I was absolutely thrilled and proud to hear about the genuine warm Cork welcome that some of the business people in our fantastic city have given to Liam and his team – well done to everyone involved. We live in a competitive world and one where we have to focus all our energy on our own business. It is too easy to forget about good manners and making a little effort to be nice and offering a genuine welcome to another business person trying to make something positive happen. The really great thing about giving a warm welcome is that it speaks volumes for those who offer it – being a great neighbour is actually great for business. This entry was posted on July 19, 2015 at 3:36 pm and is filed under Customer Care, Marketing, Positivity. You can follow any responses to this entry through the RSS 2.0 feed. You can leave a response, or trackback from your own site. Great to see this kind of good will. Makes you want to visit all the places you mentioned! Fergal – you are so right !